The vice president of Hamro Sikkim Party (HSP), Bhaichung Bhutia, reiterated the party’s demand that the Sikkim Government must pay fifth Pay Committee arrears to government employees with retrospective effect from January 1, 2016 and in a single installment. Interacting with media at the party head office at Deorali in Gangtok, Bhaichung said the State Government should immediately take out a notification announcing full implementation of the fifth Pay Committee by end of this month. He also said that the arrears from January 1, 2016 should be disbursed to all employees in one installment within a period of three months. HSP spokesperson Biraj Adhikari also pointed out that the Chief Minister had announced in his Independence Day speech that the government would be implementing the recommendations of the fifth Pay Committee. Adhikari further said that the State Government is resorting to time wasting tactics as it is unable to take a firm decision regarding the fifth Pay Committee. Bhaichung also alleged that the State Government has been giving service extensions regularly to retired government employees, mostly to those close to the SDF government and not on merit. “Public money is also wasted by providing police escorts to the ministers,” he added. 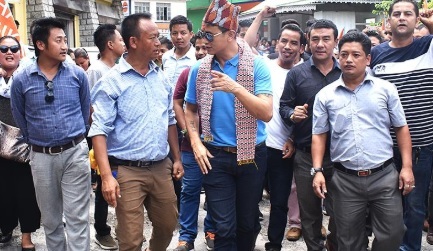 Bhaichung further assured that his party would immediately put an end to the practice of service extension, if voted to power when the State goes for Assembly elections next year.